Scatter plots are useful to show data points that lie in 2D. Drawing a scatter plot in Matplotlib is easy using the scatter function. By default, markers that are filled discs, that is of type o, are drawn. This can changed to any of the other markers available in Matplotlib using the marker input argument. The different markers of Matplotlib are shown here. The size of the marker is 20 by default. It can be changed by setting the s input argument. The edge or border of the markers are drawn in black by default. If you do not want the edges to be drawn, then set the edgecolors input argument to none (a string, not the None value). The color that is filled inside the marker is called the face color. It can be set by using the facecolors input argument. For setting the RGB values of N points, pass a NumPy array of shape (N, 3) where each color value lies in (0, 1). 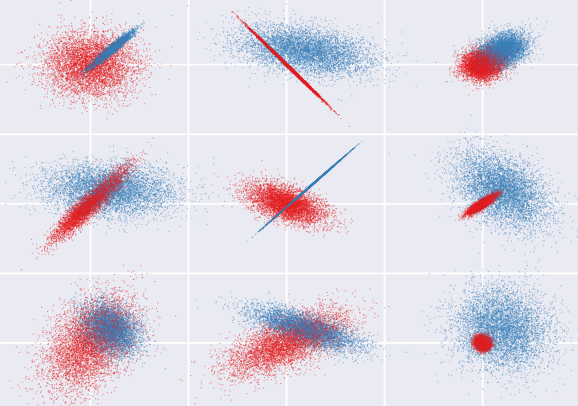 If a dense set of data points is being drawn, multiple markers could obscure each other. This situation can be improved by adding some transparency to the markers. This can be set using the alpha input argument.